And Donnie does know about a lot of things. He started collecting carnival glass in the late 60s, and moved on to clocks from there. Guns, civil war relics, pocket knives, pocket watches, toys, trains – “I deal in a little bit of everything” is no understatement. His booths are lined with artwork, as he does picture framing as well. Donnie moved to Charlottesville from West Virginia in 1948, and as a young man decided to give up his place as a student at UVA to go to an archery competition in Michigan. 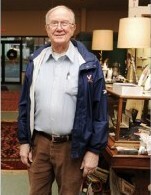 When he returned he began his 33 year career in banking, renting his first antique mall booth after he retired. He had been collecting for a decade before becoming a dealer, but he has always liked clocks, and was kind enough to share the origin of “railroad grade” pocket watches. In 1891 timing was essential for the railroads as they had many trains traveling the same tracks at different speeds. Unfortunately, the pocket watch of one engineer was four minutes slow – the crown had been pulled out accidentally – and a bloody train wreck was the result. To prevent future tragedies, standards were created, detailing size, number of jewels, even the appearance of the face – white with bold Arabic numerals. “Collectors love them because they’re higher quality,” but, as Donnie explained, a picture of a train on the back does not make it railroad grade. Stop in and take a look at Donnie Mays’s wide selection of offerings, ask him a question, or bring in a clock needing repair. Or give us a call at 434-985-1944 if you want to make sure he’s there before you come by.